On November 4th of each year, communities in Ghana celebrate National Farmers’ Day. The Ministry of Food and Agriculture, local governments and organizations give out special awards to deserving farmers based on their agricultural practices and output. In recent years these celebrations have been extra special for some farmers who have been supported by Canadian Feed The Children’s food security projects. Azuma was selected Best Woman Farmer in 2015. This past November, Gladys Gbanupuo won the Best Woman Farmer in the Lawra District, in the Upper West Region of Ghana. Gladys had been working closely with Canadian Feed The Children’s RESULT team to learn improved farming practices to increase her yield. She received special recognition for using new climate-smart innovations that are helping to improve food insecurity in her region. Gladys isn’t the first female farmer involved in Canadian Feed The Children programs to be recognized. In 2015, Azuma Ayenbuno won Best Female Farmer after receiving support through the Climate Change Adaptation in Northern Ghana Enhanced (CHANGE) project and CFTC’s local partner TradeAID Integrated. Madam Azuma, since the time that you were a child until now, have you noticed any difference with the weather or climate where you farm? If yes, what have you noticed? Yes, I have noticed difference in the weather. When I was a child, the rains used to come around March/April for the planting of early millet, late millet and guinea corn. But now, the rains come around May/June for the planting of these crops. Also, the rains in those years were evenly distributed throughout the season; but now they are very erratic and unevenly distributed. The windstorms during those years were not so frequent and destructive as we now experience. The temperatures too were not as high as we now have. Before CHANGE, what challenges did you that face in your life? Before CHANGE I did not have the requisite knowledge and skills with regards to climate-smart agricultural practices; the ultimate result was low yields from the farms and low income. The low income resulted into my inability to adequately cater for the needs of myself and my family. What new farming practices did you learn from CHANGE? I learned and implemented improved farming techniques and climate-smart agricultural practices including the following: ploughing across the slope, creating drainage channels for excess water, the application of organic manure, and proper storage of farm produce using an improved silo. Has your yields increased since you learned new practices from CHANGE? If yes, by how much? Yes, my yields have increased since I learned and started using these new practices from CHANGE; my yields have by about twice. For instance, in fields where I use to harvest 6 bags of rice per acre, I now harvest 12 to 14 bags of rice per acre. What has changed for your family since you became involved with CHANGE? My family’s standard of living has improved since I became involved with CHANGE. We now have enough nutritious food to eat throughout the year. I am able to pay for the school fees of my last two children because I now earn more money. I have even started putting up a block building to house me and my children. 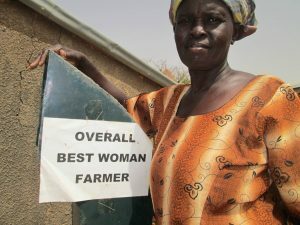 Congratulations on winning the “Best Woman Farmer of the Year” award! How did it make you feel when you received it? I felt great and yet humbled. I was really in a very happy mood when the announcement was made at the awards ceremony grounds. For the first time I was so proud to be a farmer. I am now respected in my community because of the award. The Resilient and Sustainable Livelihoods Transformation (RESULT) project is a six-year, $19-million project funded generously by Global Affairs Canada and private donors. The Climate Change Adaptation in Northern Ghana Enhanced (CHANGE) project was a three-year, $3-million project funded generously by Global Affairs Canada and private donors, which concluded in December 2015.